With the same dazzling imagination and love of language that have made Salman Rushdie one of the great storytellers of our time, Luka and the Fire of Life revisits the magic-infused, intricate world he first brought to life in the modern classic Haroun and the Sea of Stories. This breathtaking new novel centers on Luka, Haroun’s younger brother, who must save his father from certain doom. For Rashid Khalifa, the legendary storyteller of Kahani, has fallen into deep sleep from which no one can wake him. To keep his father from slipping away entirely, Luka must travel to the Magic World and steal the ever-burning Fire of Life. Thus begins a quest replete with unlikely creatures, strange alliances, and seemingly insurmountable challenges as Luka and an assortment of enchanted companions race through peril after peril, pass through the land of the Badly Behaved Gods, and reach the Fire itself, where Luka’s fate, and that of his father, will be decided. Filled with mischievous wordplay and delving into themes as universal as the power of filial love and the meaning of mortality, Luka and the Fire of Life is a book of wonders for all ages. Salman Rushdie is the author of ten previous novels--"Grimus, Midnight's Children" (for which he won the Booker Prize and, recently, the Booker of all Bookers), "Shame, The Satanic Verses, Haroun and the Sea of Stories, The Moor's Last Sigh, The Ground Beneath Her Feet, Fury, Shalimar the Clown, "and "The Enchantress of Florence"--and one collection of short stories, "East, West." He has also published three works of nonfiction--"The Jaguar Smile, Imaginary Homelands: Essays and Criticism 1981-1991, " and "Step Across This Line"--and co-edited two anthologies, "Mirrorwork" and "Best American Short Stories 2008." He is a former president of American PEN. 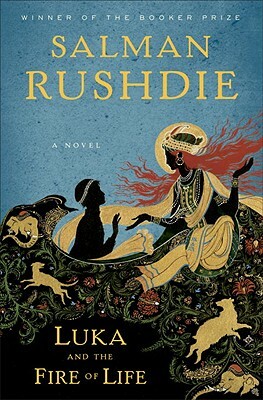 "Rushdie’s 11th novel is a sequel to his charming 1990 fable Haroun and the Sea of Stories, written—as was its predecessor—for one of its author’s two sons. Visions of Kipling and J.M. Barrie may swim through readers’ heads as we meet 12-year-old Luka Khalifa, the child of his parents’ middle age (and younger sibling to the previously eponymous Haroun), and an eager listener to lavish tales of the Magical World dreamed into being by his father Rashid, a celebrated storyteller aka “the Shah of Blah.” When Rashid falls into a mysterious prolonged sleep (and hence a silence that raises memories of Rushdie’s own “silenced” life as a writer following the fatwa issued by Ayatollah Khomeini), everything Luka has ever learned tells him he must brave the dangers of the Magical World, steal the revivifying Fire of Life from the Mountain of Knowledge and restore his beloved dad to consciousness. Guarded by animal companions (Bear the Dog, and Dog the Bear) and bedeviled by a “phantom Rashid” (aka “Nobodaddy”), the young Prometheus undertakes his heroic deed. He wins a riddling contest against the cantankerous Old Man of the River, encounters vicious Border Rats and compassionate Otters and assorted celebrities (including Mark Twain’s Connecticut Yankee and The Terminator), en route to confronting the petty, egomaniacal gods of antiquity. Adult readers will rightfully delight in Rushdie’s brilliant wordplay throughout, but younger ones may yearn for less cleverness and more narrative. Fortunately, the story gathers whiz-bang velocity once Luka has heatedly persuaded the sulky gods and monsters that “it’s only through Stories that you can get out into the Real World and have some sort of power again.” Everything races briskly toward the satisfactory completion of Luka’s quest, and a quite perfect final scene. A celebration of storytelling, a possible prequel to the book Rushdie is said to be writing about his own enforced “slumber,” and a colorful, kick-up-your-heels delight." "Luka and the Fire of Life is a beautiful book. Well-written (obviously), imaginative (astonishingly so) and wonderful in the way it builds heartfelt magical fiction for kids who love video games: It's like a bridge, built between generations, fabulous and strange and from the heart." "A book that can reach out to meet and move and touch a reader at any time of the reader's life, from childhood to middle age and beyond, is a rare and magical book, and Salman Rushdie is a rare and magical writer."